After a lot of cleanup. Placing Tide on top of our dryer worked fine for years, although probably not the wisest space-saving tip for a laundry room. However, my old-style square Tide container stayed put for the most part. If it wiggled when the clothes were drying, it only moved a quarter of an inch at most. When the square Tide container was empty, I held onto it instead of recycling because the newly designed one didn’t sit quite right. 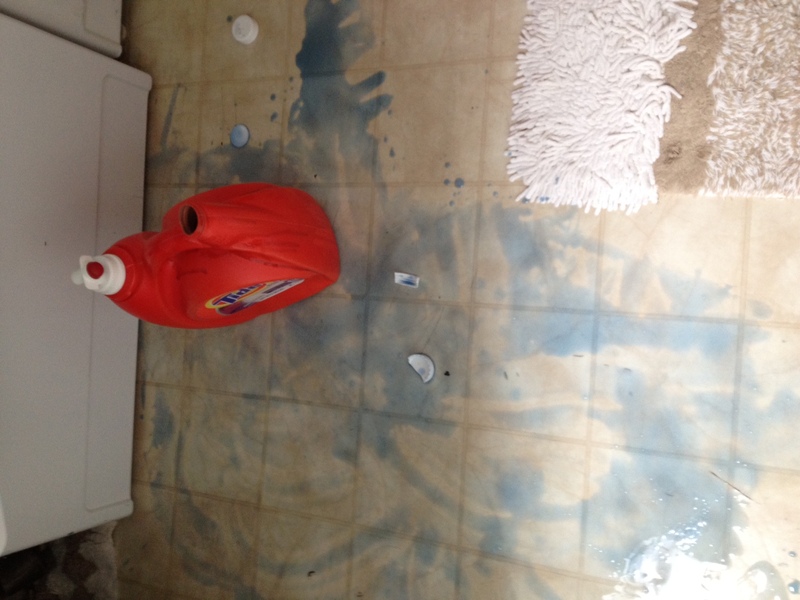 Common sense said I should refill the old bottle with the new Tide. It wasn’t fine. It was a big blue soapy mess that splattered on a rug and shoes, ran under the dryer, and took 13 cloths to sop up whatever mess I couldn’t scoop with a manila folder (all I could think to grab). When I washed the cloths, the washing machine nearly overflowed with bubbles. After a week, the floor still feels like a Slip ‘n Slide when it gets wet. I’m happy to share what I learned about safely using the newly designed Tide container (on the right). 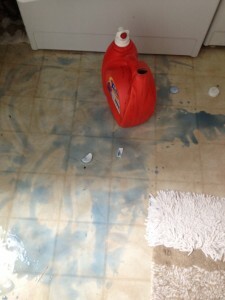 Tide tip #1: If you want a bit of waterpark fun in your laundry room and the cleanest floor in town, follow my example to a T (appropriate letter, don’t you think?). Tide tips #2, #3 and #4: If you care more about keeping Tide in the bottle until you need it for your clothes, follow one of these three tips. Place your newly designed Tide container on a steady shelf, not the dryer top. Refill the old-style square Tide container (on the left) with new Tide. 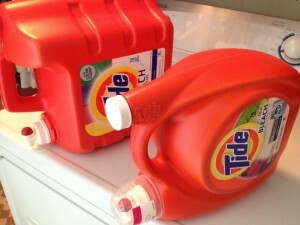 Buy a Tide container without a dispenser, store it on a steady shelf, and get used to pouring your laundry liquid. View Miracle Montana Stain in Tide commercial from Super Bowl 2013. 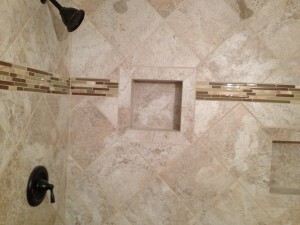 Why Choose a Custom Shower? Design a custom shower and you’re only limited by your imagination. Although custom showers typically cost about twice that of standard ones, customers agree it is money well spent on a space that is used daily, and to have the size and look you want. Possibilities are endless including built-in seats, a short ledge for shaving your legs, multiple fixtures that spray in all directions, and nonstandard shapes. Accessories like storage racks, grab bars, and pocket shelves (shown in photo) can be installed wherever you like. Almost any tile is shower-friendly. 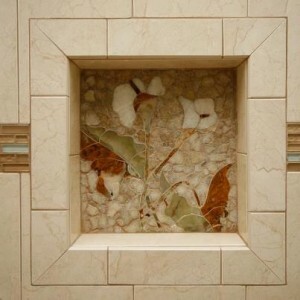 The choices range from travertine, marble and custom stone to tiles made from ceramic, porcelain and glass. Another plus is custom showers can accommodate any space no matter how small or large. Here are some custom shower tips from HGTV. 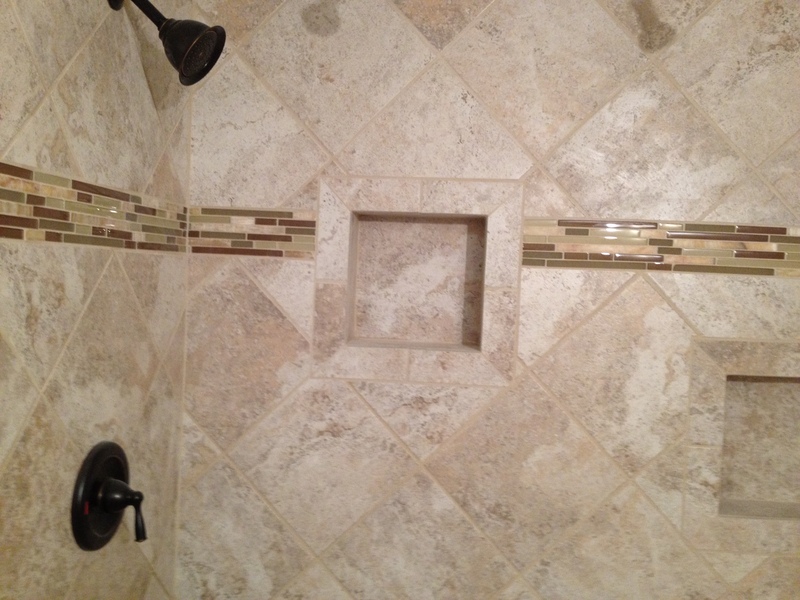 To assure your custom shower is nearly maintenance free, ask for epoxy grout because it is stain resistant and durable. Read what This Old House says about epoxy grout. Finally, take your custom shower to the next level with designs by Andi Pepperney, co-owner of Art Mosaics of the Carolinas in Murrells Inlet, S.C. One of her favorite mosaics (shown here inserted in a pocket shelf, photo used with permission) is the Onyx Calla Lily. Next on her list of blooms to create is an Onyx Orchid. The accent includes natural stone, porcelain and glass. Art Mosaics of the Carolinas digitally renders the design by computer for clients’ approval. Call SCI – Southern Coast Improvements at 843-421-9255 for a free consultation, and ideas about adding a custom shower to your home.